A huge number of M113 Armored Personnel Carrier variants have been created, ranging from infantry carriers to nuclear missile carriers. The M113 armored personnel carrier has become one of the most prolific armored vehicles of the second half of the 20th century, and continues to serve with armies around the world in many roles. In 2005, Afghanistan received 15 second-hand M577A2 command and control vehicles from the United States. In 1967, the Argentine Army received from USA 250 M113A1 APC, 10 M577A1 command and control vehicles and 12 M548A1 cargo carriers. In 1992, they received from USA 200 M113A2 APC, 25 M106A1 mortar carrier, 10 M577A1 command and control vehicles and 16 M548A1 cargo carriers. Some variants are modified by the Army's Comando de Arsenales. M106A2 - M106A1 mortar carrier modified with a 120mm FM mortar. M113 Defensa Aerea - M113 APC with a 20mm Oerlikon GAI-BO1 cannon. M113 Sanitario - M113 APC modified to serve as an armoured ambulance. M548A2 - M548A1 cargo carriers modernizated to A2 version. M113A2 RASIT - M113A2 APC fitted with a RASIT radar to serve as reconnaissance vehicle. M113A2 w/ 20mm turret - M113A2 APC fitted with a CITEFA 20mm turret. Wikimedia Commons has media related to M113 armored personnel carriers in Australian service. Some Australian AFVs have the suffix "AS" (the NATO code for Australia), often appended by a model number. Generally speaking, Australian models are modified from the original models, in the case of the M113A1 series this included the AN/VIC-1 communications harness, large dust filters for the passenger compartment ventilation blower, heavy steel track manufactured by ADI, provision for 600 kg of belly armor, the Cadillac-Gage T-50 turret mounting twin .30 Brownings (early service) or a .30/.50 Brownings machine guns for APC/LRV versions, a traverse bar to prevent the crew commander traversing the turret to the rear over the troop compartment roof hatch with the guns depressed low. For some reason, besides the M577A1 command vehicle, all of versions of the M113A1 had the passenger compartment heaters removed. In the late 1980s, the fleet was issued with German BM8005 image intensifying night vision driving periscopes, which, with the aid of an adaptor, could be fitted to replace the driver's central periscope for night driving. In the early 90s, the fleet was issued with VINSON family cipher equipment, typically a single KY-57 per vehicle. This allowed the command net to be enciphered, but the admin net would normally work en clair. M113A1 Fire Support Vehicle (FSV) - Full designation Carrier, Fire Support, Full Track M113A1 (FS) Saladin Turret was a variant fitted with the turret from the Alvis Saladin armored car. The FSV was introduced into Australian Army units in the mid-1960s following the withdrawal of the Saladins and was armed with a 76mm gun, a .30 caliber coaxial machine gun and a .30 caliber machine gun mounted on the roof of the vehicle's turret. The M113 was an interim vehicle and was replaced by the M113 Medium Reconnaissance Vehicle in the late 1970s. It was commonly referred to by Royal Australian Armoured Corps crews as the "Beast". M113 Fitter - Armored recovery vehicle with HIAB (Hydrauliska Industri AB) crane on hull roof. M113A1 Light Reconnaissance Vehicle/APC - A standard M113A1 with a Cadillac Gage T50 turret as used on the V100/V150 series of armored cars, mounting two Browning machine guns, a .30 caliber and a M2 .50 caliber machine gun. While the standard armored personnel carrier version in Australian service is also fitted with the T50 turret, it initially carried only twin .30 caliber machine guns. In later service, the LRV and APC versions both carried the 30/50 combination and the only difference between them was roles. LRVs, which carried a crew of 2 or 3 (crew commander, driver and sometimes operator/observer), were used in the sabre (recon) troops of the Cavalry regiment and the recon troop of the Armoured regiment. APCs carried a crew of 2 plus several dismounts, either infantry, assault troops, engineers or other troops. In practise, an LRV was also perfectly capable of carrying troops, though in perhaps somewhat more cramped conditions as LRVs often carried additional stores and ammunition and had seats removed and replaced with storage lockers. For a short period of time in Vietnam, the Aircraft Armaments Incorporated Model 74C Cupola/Command Station was used, but it was quickly replaced by the T50. Also used by the New Zealand Army until the M113 was replaced in 2005. The T50 turret was initially fitted with an optical sight, however in later years this was removed and the guns were solely aimed using ranging bursts of 6-10 rounds (2 tracer). The diesel burning heater is removed from the M113A1 - though numerous diggers note that this is not the case with the Australian Army's M577s (command post vehicles). M113A1 Medium Reconnaissance Vehicle (MRV) - Full designation Carrier, Fire Support, Full Track M113A1 (FS) Scorpion Turret was an Australian variant similar to the M113 FSV, but using the turret from the FV101 Scorpion light tank, instead of the older turret of the Saladin armoured car, that the FSV had previously used. This turret was equipped with an Image Intensifier sight for the main armament. This II sight was the first effective passive night sight fitted to an Australian AFV, giving the MRVs a night fighting capability exceeding the Leopard AS1 and all other Australian AFVs of the period. Whilst fully amphibious, the MRV was also fitted with a light sheet-metal foam-filled trim vane and side pods. These pods and the trim vane were intended to provide additional flotation and stability on the water; they provided virtually no additional armour protection. Other changes included a modified driver's hatch which pivoted toward the centre-line of the vehicle instead of opening to the rear of the driver's hatch; this feature preventing the open driver's hatch being caught on the traversing turret, as well as the fitting of the British "boiling vessel", an electric vessel for boiling water and heating rations. As indicated by the designation change, the MRVs were roled as reconnaissance vehicles and issued to the Cavalry (medium reconnaissance) regiments with each troop equipped with 3 LRV and 2 MRV; whereas the FSVs were originally issued to APC squadrons and used to provide infantry fire support. The MRV replaced the FSV in Australian service. M113AS3 - significantly upgraded M113A1 with new engine, transmission, steering, suspension, brakes and hull protection. M113AS4 - upgraded to the same standard as the AS3, lengthened to fit an additional road wheel station and fitted with a new Tenix Defence designed electronically driven "one man turret" with 12.7mm heavy machine gun and sight. M113B - Basic M113 modified by Motopeças, of São Paulo. The original Chrysler 75M petrol engine was changed to one Mercedes-Benz OM352A diesel engine, with 180 hp. Transmission and other parts are changed too. M113BR - Modernization of M113B, made by BAE Systems and the Brazilian Army's Parque Regional de Manutenção/5 (Regional Maintenance Park nº5), in Curitiba. Is a version of M113A2 Mk.1 modernization pack, of BAe Systems, fitted with a Detroit Diesel 6V53T engine, with 265 hp, Allison TX100-1A cross-drive transmission, Harris FALCON III radios and Thales SOTAS intercom. M113-T - Proposed modernization of M113B by Tractto, Medianeira Mecânica and UFSM. Fitted with a MWM engine. M577A2 - Command and Control version of M113A2, donated by USA. 34 delivered in September 2016. BMF from Belgium has built the M113A1 with some modifications (using the suspension of the M113A2, NBC protection system etc.) under license as the M113A1-B, The Belgian army received 525 vehicles from 1982. M113A1-B-ATK - Basic APC version with M2HB .50cal machine gun. This type is no longer used and most have been modified into new versions. M113A1-B-Amb - Ambulance with room for 4 litters. This type is unarmed but is fitted with six 76mm smoke grenade launchers. M113A1-B-CP - Command post vehicle that retains the low roofline of the basic version. M113A1-B-ENG - Squad vehicle for combat engineers. Some of the 113 delivered are fitted with an hydraulic dozerblade. M113A1-B-MIL - Tank hunter with pintle-mounted MILAN and two 71mm Lyran mortars. All 56 vehicles have been modified into artillery FO vehicles. M113A1-B-Mor - The original version was used to carry the M30 4.2" mortar, but all 35 vehicles have been upgraded to tow the Thompson-Brandt MO-120-RT 120mm mortar. M113A1-B-MT - Maintenance vehicle with folding work table on the right rear. M113A1-B-MTC - Maintenance vehicle with hydraulic HIAB crane. Similar to the M579. M113A1-B-Rec - recovery vehicle with a heavy internal winch. Similar to M806. M113A1-B-SCB - Carrier vehicle for mast-mounted battlefield surveillance (Surveillance de Champ de Bataille) radar EL/M-2130A. M113A1-B-TACP - Modified command post vehicle for dedicated TACP missions. M113A1-B-VW - Former MILAN carrier that is now used by artillery forward observers. It retains the .50cal machine gun on the 3rd cupola behind the driver, but the commander's cupola has the MILAN post replaced by a portable laser range finder MLR-N61. AIFV - A development of the M113A1 APC, upgraded with an enclosed turret and firing ports. ADATS Carrier (Air Defence Anti-Tank System) – Air-defence vehicle variant, developed collaboratively between Lockheed Martin and Oerlikon Contraves, first fielded by the Canadian Forces in 1988. The system features a turret with an eight tube ADATS missile launcher based on M113A2 based chassis. On top of the turret is an X-band radar with a range of 25 km. Used solely by the Canadian Forces, the ADATS has been withdrawn from Canadian service with no planned replacement announced as of late 2012. The missile was evaluated by the US Army (LOS-F-H program), but not selected for adoption. TLAV in Afghanistan with cage armor, 2010. MTV-E (Mobile Tactical Vehicle Engineer) Military engineering version equipped with a large plough blade on the front, a hydraulically powered auger on the rear driver's side, and hydraulic hoses for use with hydraulic tools opposite the auger. MTV-R (Mobile Tactical Vehicle Recovery) Recovery vehicle equipped with a 20,000 kg winch and an integrated crane. LAV-T/CP M577A3 Command Post, nicknamed the 'Queen Mary', carries a communications suite in a heightened hull. LAV-T (Light Armoured Vehicle - Tracked) Standard version M113A3 equipped with either a Cadillac 1m turret or an RWS system. M113A2 TUA (TOW Under Armour) - Canadian version of the NM142 anti-tank vehicle. Very similar to the Norwegian version, but with external fuel tanks. M113A2 EVSEV (Engineering Variant Specially Equipped Vehicle) - Variant of the M113A2 for engineer units. Fitted with a front-mounted dozer blade, hydraulic ground auger and hydraulic power tools. The hydraulic pump and fluid reservoirs were mounted inside the hull necessitating the development of the initial modification for external fuel tanks mounted on each side of the rear ramp. M113A2 Mk 1 DAREOD (Damaged Airfield Reconnaissance Explosive Ordnance Disposal) - EOD variant of the M113A2 Mk 1 with 265 hp Detroit Diesel engine. This type is equipped with a 1-man turret, additional search lights and Pearson mine-clearing equipment. Build 1989 - 1993 by E. Falck Schmidt in Odense, and implemented 1992, the M113A2 is armed with a 25 mm Oerlikon-Contraves machine-cannon ranging up to 1,500 m and a German 7.62 mm machine-gun mounted co-axially. The 25 mm Oerlikon-gun has a firing-rate of approx. 600 rounds a minute. The guns are mounted in an Italian Oto Melara turret. The M113A2 has a thermal sight produced by Zeiss. It is used in armoured infantry companies - each company having 2 M113A2s. 50 units were ordered. The main differences between the A1 and A2 versions is that the latter has a more powerful turbo-charged engine (Detroit Diesel, 6V53T developing 265 hp at 2,800 rpm), improved suspension and an improved cooling- and heating-system. When implemented at the IFOR/SFOR forces in the former Yugoslavia, 6 M113A2s were retrofitted with "add-on armour". The body is protected with the FMC armoured plates, "spall liner" and "belly armour", the fuel-tanks are filled with "safety foam balls" and the turret with a Danish kit consisting of ceramic and armoured plates developed by E. Falck Schmidt and Roulund in Odense. The M113A2 can resist fire from weapons up to 14.5 mm at a range down to 100 m.
The M113A2 was nicknamed "Wildcat" in the first stages of the project, but due to copyright-problems, it was never officially adopted. The project was worth 357 mil. DKr (1987). With the Defence Agreement 2005 - 2009 made in 2004, it was decided that the M113A2 would no longer be a part of the Danish Army's inventory. A few have been rebuilt as fire fighting vehicles to supersede the ageing M113A1 fire fighting vehicles. M113A2 MK I DK, 2004. GefStdPz - (Gefechtsstandpanzer) - M557 Command and control vehicle with a raised roof. FlgLtPz - (Fliegerleitpanzer) - Vehicle for forward air controllers (FAC) (retired from service). RiFuMuxPz - (Trägerfahrzeug Richtfunk Multiplex) - Direction finding station (retired from service). SchrFuTrpPz VHF-HF - (Schreibfunktrupppanzer) - Signals vehicle. TrFzRechnVbuArt - (Trägerfahrzeug Rechner-Verbund Artillerie) - Artillery computer vehicle. FüFlSt - (Führungs-Feuerleitstelle) - Fire direction center for artillery units equipped with the PzH 2000. BeobPzArt (Beobachtungspanzer Artillerie) - Artillery forward observer vehicle with raised roofline and PERI D-11 periscope (retired from service). FltPzArt (Feuerleitpanzer Artillerie) - Artillery fire direction vehicle. FltPzMrs (Feuerleitpanzer Mörser) - Fire direction vehicle for mortar units (retired from service). FüFuPz (Führungs- und Funkpanzer) - Signals and command vehicle (retired from service). KrKw (Krankenkraftwagen) - Ambulance, to be replaced by Boxer MRAV. PzMrs (Panzermörser) - Mortar carrier with Tampella 120mm and 63 rounds (reactivated). TrFz ABRA (Trägerfahrzeug) - Carrier vehicle for DR-PC 1a RATAC radar, to be resplaced by BÜR (ground surveillance radar system, based on Dingo 2). TrFz Green Archer (Trägerfahrzeug) - Carrier vehicle for Green Archer artillery location radar (retired from service). Waran - Upgrade developed by FFG. Has the same improvement as the NDV-2 versions, but is additionally fitted with a longer hull and improved suspension with 6 road wheels on each side. Also known as M113 King Size. EIFV - Features an enlarged chassis with improved armor, a more powerful engine, and the addition of M2 Bradley turrets. The vehicle carries a crew of three and six dismount soldiers. Uparmored M113 (also known as SIFV) - Basically an M113 fitted with an armor upgrade kit produced in Egypt, allowing the M113 to withstand up to 23 mm armor-piercing rounds, without affecting the vehicle's mobility or amphibious capability. The weight of the additional armor is about 950 kg and within the vehicle permissible load and equipped with the 25 mm KBA-B02 turret. This armor upgrade can also be fitted to variants such as the AIFV or the above-mentioned EIFV. Bardehlas (Hebrew for cheetah) - Israeli designation of the M113 APC. The name is rarely used as the M113 is usually referred to as Nagmash (APC). In the past M113 was colloquially known as Zelda, but by 1990 the name fell out of use. Vayzata - Upgraded Bardehlas (M113) with Toga/Vayzata armor suite - perforated steel plates mounted on an external frame around the front and sides of the vehicle. There is also a special command version with additional radio equipment and an auxiliary power unit, typically referred to as Nagmash pikud (command APC). Classical - M113 equipped with reactive armor and armored shields around roof hatches. It was introduced in the mid-1990s and saw action in the Southern Lebanon security zone. The added weight of the armor led to limited mobility and reliability problems and the vehicle was eventually removed from service. Nagman (Nagmash Memugan - APC with additional protection) - M113 equipped with Toga armor suite, an open-topped hexagonal superstructure around the commander's hatch and armored shields on the sides of the rear roof hatch. Kasman (Kesem ha-Mangina – The Charm of Music) - An urban warfare / counter insurgency upgrade of Nagman developed just before the Al-Aqsa Intifada. The superstructure became a fully closed one and the shields were extended. Magen or Kasman Magen or Kasman Meshupar - Equipped with Toga armor suite, a large armored superstructure around the roof hatches and external fuel tanks. Developed in the early 2000s. Maoz or Kasman Maoz - Similar to Magen, but with a smaller superstruture. Developed in the early 2000s. Giraf - M113 with a TOW launcher. Hafiz - M113 with a 6-tube Spike NLOS ATGM launcher. Hovet, also spelled Chovet - Israeli designation for the M163 VADS. Machbet - An Israeli upgrade of the M163 VADS. In addition to the 20 mm M61 Vulcan rotary cannon, it is armed with a four-tube FIM-92 Stinger surface-to-air missile launcher. Nagmash Mahag - Israeli designation of the M579 Fitter. Nagmash Hatap, also spelled Chatap - A field repair vehicle for carrying spare parts and equipment specific to the vehicles it is tasked to support. Mugaf - Israeli designation of the M577 command post carrier. Alfa - Israeli designation of the M548 cargo carrier. Shilem - Unarmored vehicle equipped with EL-M-2310 radar for artillery forces. M113 AMEV - Armored Medical Evacuation Vehicle. A specifically modified and equipped M113 for use as an armored ambulance. M113 HVMS - A prototype armed with a HVMS 60 mm gun in a turret. M113 L-VAS - A prototype equipped with Light Vehicle Armour System (L-VAS). Urban Fighter - IMI developed modification, with upgraded "Iron Wall" armor, capable of repelling IED and EFP attacks. Keshet - 120 mm mortar carrier. VCC-2 - Oto Melara VCC-1 improved version without rear sloped armor (11 passengers); about 1,230 produced by updating older gasoline M113. SIDAM 25 - A Self-propelled anti-aircraft weapon 276 made by upgrading old M113 plus about 150 for 25 mm ammo supply. M113 with 120 mm mortar, a M113 version developed with a French 120 mm in the place of the 107 mm US mortar. Several hundreds made, 150 of them were exported to Libya in the '80s. Jordan received 150 M577 Command Post vehicles as a gift from the United States in February 2018. M113A1 - The normal M113A1 APC, used for the infantry groups of the cavalry reconnaissance battalions and independent cavalry reconnaissance squadrons as well by the Koninklijke Marechaussee, the Dutch military police. M113A1 PGN - Pantser GeNie. M113A1 equipped with engineering and demolition equipment, in use by armoured engineer companies. M113 C&V - Commando & Verkenning. Dutch version of the M113 Lynx, initially equipped with a Browning M2 .50 heavy machine gun in a remote controlled cupola, afterwards modified with an Oerlikon KBA 25mm autocannon in a manually operated turret. M106 - Mortar carrier with 81mm mortar, in service with the cavalry reconnaissance battalions and squadrons. M113A1 GWT - GeWonden Transport. A specifically modified and equipped M113 for use as an armored ambulance. M577 - Command post vehicle, used by cavalry reconnaissance battalions and squadrons, artillery battalion and battery headquarters as well as brigade level headquarters. M113A1 RDR - RaDaR M113A1 equipped with a battlefield surveillance radar system used by cavalry reconnaissance battalions and squadrons. M806 - Locally known as 'YPR-806 A1 PRB' (PRB = Pantser Rups Berging (Armoured Recovery Vehicle)). Repair and recovery vehicle in use with units equipped with the AIFV. M578 - Light Recovery vehicle. 25 in use for recovery of M113 and M107, M110 and M109 self-propelled howitzers. M688 - Lance missile transport/loader vehicle based on the M548. M752 - Self-propelled launcher for MGM-52 Lance tactical surface-to-surface missile (tactical ballistic missile) system, in service with the nuclear capable 129 Afdeling Veldartillerie (129 Field Artillery Battalion). F1 - Vehicle with fragmentation protection (spall-liner). F2 - Vehicle with fragmentation and mine protection. F3 - Vehicle with fragmentation and mine protection, additional armor protection and a new engine. Furthermore, a fourth variant, the M113F4, has been developed, but it was ultimately set aside in favor of FFG's ACSV, which is based on the PMMC G5. NM125 (Bombekastervogn) - Norwegian variant of the M113 similar to the M106 mortar carrier, but with an 81 mm M29 mortar. NM135 (Stormpanservogn) - Norwegian variant of the M113A1 with a 20mm Rheinmetall MK2020 machine cannon with a 7.62mm coaxial machine gun in a turret. The 20mm gun had a firing rate of about 900 rounds/min. Retired from service. NM135F1 - Version with additional spall-liners. Retired from service. NM142 (Rakettpanserjager) - Anti-tank variant of the M113A2 used by the Norwegian army, equipped with the Armoured Launching Turret, developed in Norway by Kvaerner Eureka. The ALT contains a TOW-2 guided anti-tank missile system with one launch tube on either side of the turret. Additionally, mounted on the commander's hatch, there is a Rheinmetall MG3 machine gun for use as secondary armament and in situations where the TOW-2 system is unsuitable. Retired from service. NM142F1 - Version with additional spall-liners. Retired from service. NM194 (Ildlederpanservogn, luftvern) - M113A2 air-defense command vehicle. Retired from service. NM195 (Luftvernpanservogn) - M113A2 air-defense variant with RBS-70. Retired from service. NM196 (Hjelpeplasspanservogn) - Medical treatment version of M577A2. NM196F1 - Version with additional spall-liners. NM197 (Replagspanservogn) - Armored maintenance vehicle, based on the M113A2. NM198 (Kommandopanservogn) - Modified command variant of the M577A2. NM198F1 - Version with additional spall-liners. NM199 (Transportpanservogn) - New designator for modified M548A1. NM200 (Ambulansepanservogn) - Ambulance version of M113A2. NM200F1 - Version with additional spall-liners. NM201 (Ildlederpanservogn, artilleri) - M113A2-based vehicle for artillery forward observers. This variant is fitted with the VINTAQS observation system on a 2m mast. It consists of a thermal camera, VingRange laser range finder, VingEye CCD-camera and GPS. NM201F1 - Version with additional spall-liners. NM201F3 - Version with additional spall-liners, mine protection, additional passive armor and new power-pack. NM202 (Ledelsespanservogn) - Command variant of the M113A2. NM202F1 - Version with additional spall-liners. NM202F3 - Version with additional spall-liners, mine protection, additional passive armor and new power-pack. NM204 (Bombekasterpanservogn 81MM) - Upgrade of the M125A2 mortar carrier. NM205 (Stormingeniørpanservogn) - Variant of the M113A2 for combat engineers, fitted with mine clearing rollers or ploughs. NM205F1 - Version with additional spall-liners. NM205F3 - Version with additional spall-liners, mine protection, additional passive armor and new power-pack. NM209 (Panservogn, personnel) - Modified APC, based on the M113A2. NM216 (TADKOM-knutepunktvogn) - Signals vehicle. M113A1 - The legacy M113A1 vehicles were acquired from 1967 onwards. XM806E1 - armored recovery vehicle variant. M113A1 Fire Support Vehicle (FSV) - Philippine Army variant of the M113A1 fitted with the 76mm low pressure gun turret of the FV101 Scorpion. M113A1 Mortar Carriers - Philippine Army variant of the M113A1 converted for use as an armoured mortar carrier. M113A2 - The US 'Excess Defense Articles (EDA)' programme allowed the Philippine Army to acquire 114 M113A2 vehicles from US stocks, with deliveries beginning in 2012. Another acquisition saw the Philippine Army acquire 28 more M113A2 vehicles, which Elbit Systems will upgrade under the terms of a $19.7 million contract. M113A2 Fire Support Vehicle (FSV) - 14 Fire Support Vehicles (FSV) will be equipped with the turrets of decommissioned Alvis Scorpion armoured reconnaissance vehicles, a new fire control system and thermal imaging system. The two-person Scorpion turret is armed with a 76 mm L23A1 gun and a 7.62 mm co-axial machine gun (MG) with day/image intensification sights. Four of the M113A2 will be equipped a 25 mm cannon mounted in an Elbit Remote Control Weapon Station (RC WS), six will have an RC WS mounting a 12.7mm machine gun. M113A2 Armoured Recovery Vehicle (ARV) - Four M113A2s will be configured as ARVs. 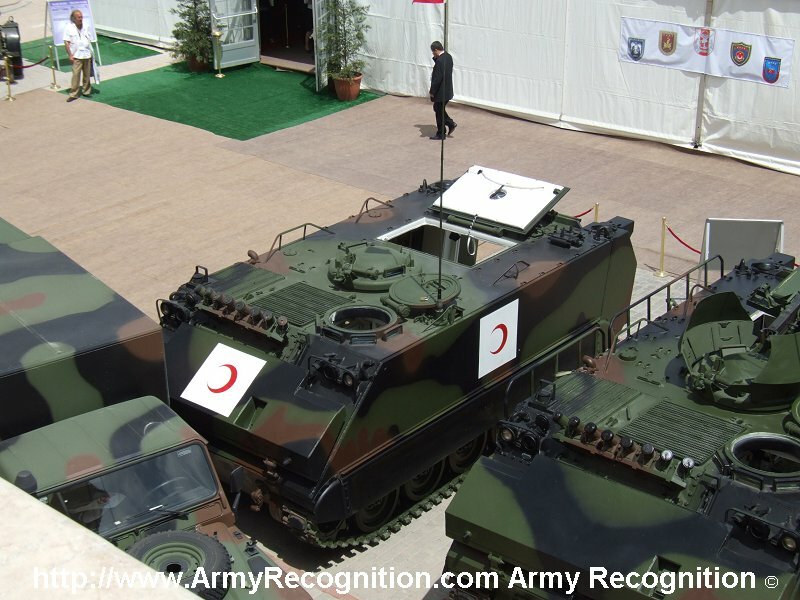 The Portuguese Army operates 150 (of 180 delivered) in the A1 and A2 variants of the basic M113 armored personnel carrier (M113 A1/2 M/76 a 90, or simply, M113). Besides the M113 APC, the Portuguese Army operates 107 mm mortar carriers, self-propelled surface-to-air missile systems, TOW anti-tank guided missile tank destroyers, ambulance, command and communications variants of M113. M577A2 M/81 ACP (M577) - 36 in service, as command vehicles. M577A2 M/85 Ambulance (M577) - 3 in service, as ambulance vehicles. M730 / M48A3 (Chaparral) - The Portuguese Army has operated 30 M730 self-propelled surface-to-air missile systems, today it operates 25 vehicles. In service with the Portuguese Army since 1990. Portugal initially received 30 M730 in the A2 variant and afterwards 4 vehicles in the A3 variant. M901 ITV (M901/TOW) - The Portuguese Army received 4 M901 ITV in 1990; these are still in service. The Portuguese Army made 30 similar vehicles using M113A2 APCs and M220 TOW launchers. The major difference between the variants is that the latter type had a single launcher instead of the twin launcher of the M901. M113A2 Ultra IFV - Originally an M113A1, it was upgraded to that of A2 standard and modernized by ST Kinetics with a locally-built gun-turret cupola-mounted CIS 40mm AGL (Automatic Grenade Launcher) and CIS 0.5-inch HMG (Heavy Machine Gun) twin-type weapon station or the Israeli Rafael Overhead Weapon Station with the US M242 Bushmaster 25 mm caliber auto-cannons plus improved armour. 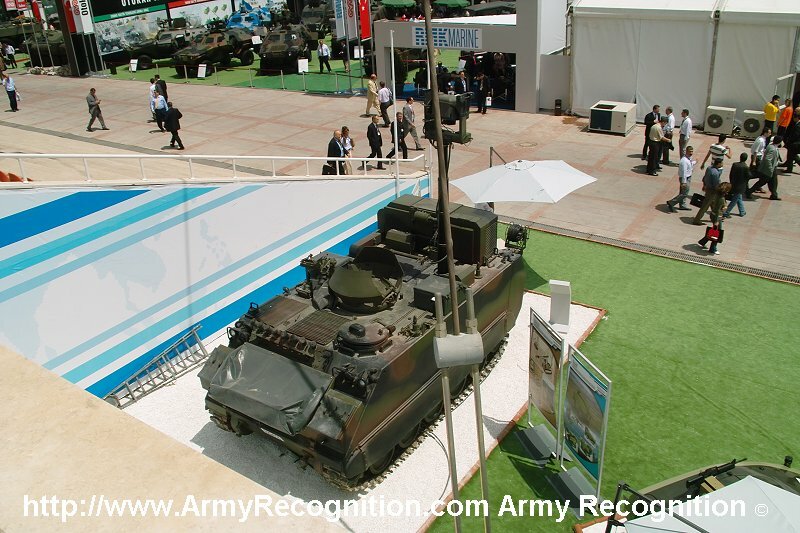 This Singapore-upgraded M113 version is operated by the Armour Formation of the Singapore Army. Today, it is gradually being replaced by the locally designed Bionix Infantry Fighting Vehicle (IFV) as well as the Bronco twin-carriage tracked armoured personnel carrier (APC). M113A2 Ultra Mechanised Igla - Of the same as the one above, but armed with six ready-to-fire Soviet Igla SAMs (surface-to-air missiles) and configured for the role of short-range air defense (SHORAD). The Integrated Fire Unit (IFU) variant is equipped with an advanced fire-control radar to assist in pin-pointing the location of enemy aircraft to be shot down whilst the Weapon Fire Unit (WFU) version lacks the centrally-mounted radar but can be cued and directed by the fire-control radar of the former. 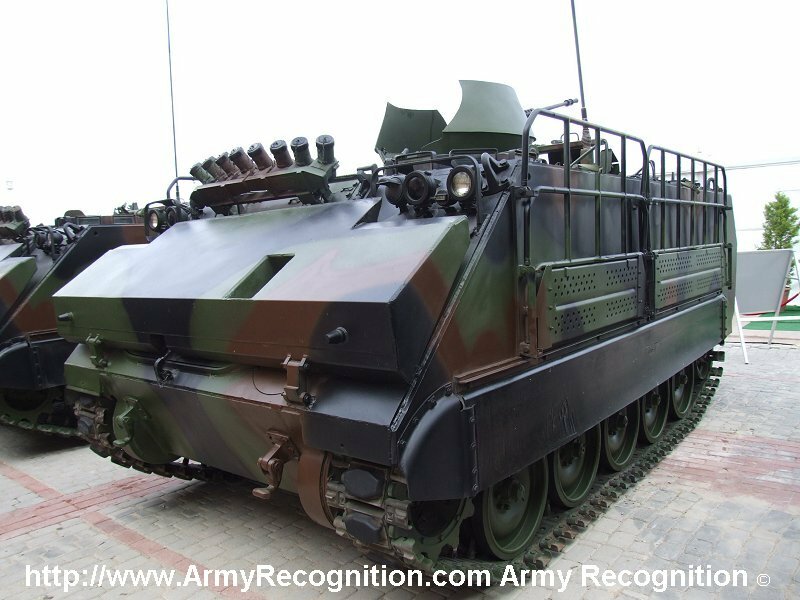 This Singapore-modified version of the M113 is fielded by the Republic of Singapore Air Force (RSAF) for use in ground-based air defence. The M113A2 Ultra Mechanised Igla Integrated Fire Unit (IFU). The RSAF's M113A2 Ultra Mechanised Igla IFU. Note the mast-mounted cylindrical-shaped fire-control radar. The RSAF's M113A2 Ultra Mechanised Igla Weapon Fire Unit (WFU). A visual comparison of side-profiles between a Mechanised Igla IFU & a WFU. M113 w/ M8 turret - The Army of the Republic of Vietnam (ARVN; South Vietnamese Army) fitted a small number of M113 armored personnel carriers with turrets taken from obsolete M8 Greyhound armored cars. Übermittlungspanzer 63 with telephone wire drums. Schützenpanzer 63 - Designation of the basic M113A1 in Swiss service. Schützenpanzer 63/73 - Variant of the SPz 63 with a front float panel (found on the M113A2), as well as a Swedish Hagglunds turret fitted with an Oerlikon 20 mm cannon Kan 48/73. Schützenpanzer 63/89 - Upgrade of the SPz 63/73 with additional passive armor, 76mm smoke grenade launchers and RISE power-pack. Kommando Schützenpanzer 63 - Command vehicle variant with .50cal machine gun. Kommando Schützenpanzer 63/89 - Command version of the SPz 63/89, which retains the 20mm gun turret. Kranpanzer 63 - Swiss designator for M579. Feuerleitpanzer 63 - Improved command vehicle, specifically designed as a fire control center for mobile artillery units. Feuerleitpanzer 63/98 - Upgraded version with INTAFF system (Integriertes Artillerie Führungs- und Feuerleitsystem). Geniepanzer 63 - Schützenpanzer 63 fitted with a bulldozer kit. Minenwerferpanzer 64 - Swiss variantion of the M106A1 mortar carrier, substituting the Thompson Brandt 120mm mortar for the previously installed weapon. Swiss M106A1's initially had substituted a Thompson Brandt mortar of 81mm type for the standard 4.2"/107mm M30 mortar found on US models. Minenwerferpanzer 64/91 - Upgraded version. Minenräumpanzer 63/00 - Mineclearing vehicle, based on the SPz 63/89 and fitted with lightweight mine clearing ploughs. The turret was removed and replaced with an armored work station for the operator. Übermittlungspanzer 63 - Signals vehicle. CM-21 - a Taiwanese indigenous design based on the M113, with many improvements and design changes to meet Republic of China Army requirements. The size, shape and performance of the CM-21 is almost identical to the M113, but with different engines and transmissions throughout the years. Various variants produced from 1982 to 2009, over 1000 produced. CM-22 - Mortar carrier for 107mm/120mm mortar (similar to M106). CM-23 - Mortar carrier for 81mm mortar (similar to M125). Atılgan PMADS - M113A2T2 with a fully automated firing unit for Very Short-Range Air Defence System (VSHORADS) missiles such as the FIM-92 Stinger, providing autonomous as well as coordinated operation with C3I systems and other air defence assets. Tracked Rapier at RAF Museum Cosford. Tracked Rapier - Octuple surface-to-air missile launcher for the Rapier missile system originally commissioned by Iran but taken over by the British after the 1979 Revolution. No longer in service. XM45/E1: Lightly armored servicing and refueling vehicle for the M132 based on the M548. M58: The Wolf Smoke Generator Carrier can produce 90 minutes of visual and 30 minutes of infrared screens. XM106/M106: Self-propelled Mortar carrier with 107 mm (4.2 inch) M30 mortar firing through large, circular roof hatch in hull rear. Before the US Army changed their designation system, the XM106 was known as the T257E1. M106A1: M106 with diesel engine. M106A2: M106A1 with M113A2 improvements. M113 AMEV: Armored Medical Evacuation Vehicle. A specifically modified and equipped M113 for use as an armored ambulance. M113 OSV: OPFOR Surrogate Vehicle (OSV) used to simulate enemy tracked vehicles in force-on-force training. M125: Mortar carrier similar to M106, but with 81 mm M29 mortar. M132 Armored Flamethrower: A full-tracked self-propelled flame thrower carrier, with small turret carrying an M10-8 flamethrower and coaxial M73 machine gun, plus fuel and pressure tanks in rear of hull. M132A1: Modified M113A1s rather than M113s. M163: The Vulcan Air Defense System (VADS) is an M168 anti-aircraft gun mounted on the M741 carrier. M474: Carrier used as Pershing 1 nuclear missile Transporter erector launcher (TEL) and as Warhead Carrier, Programmer Test Station/Power Station carrier and Radio Terminal Set carrier. XM546: Guided missile carrier/launcher for the MIM-46 Mauler surface-to-air missile. XM546E1: Proposed version with a lengthened chassis featuring a sixth set of road-wheels. XM548/M548: Unarmored 6 ton cargo carrier. XM548E1: Unarmored carrier/launcher for the MIM-72 Chaparral surface-to-air missiles of the M54 system. Redesignated XM730. M577: This variant is used as a command vehicle, generally as a Tactical Operations Center (TOC). The passenger compartment is raised to 74.75 in (189.9 cm). The compartment has a commander's hatch with no weapons mount or vision blocks. A tent is carried on the top rear and attaches directly to the rear of the track to provide greater work space. Multiple M577s can be connected via the tents to form a larger operations center. An additional fuel tank is mounted in the right rear of the compartment. Long-range communications is expedited by the use of a hand-cranked extendible antenna system. A 4.2 kW auxiliary power unit (APU) is mounted on the right front of the vehicle to provide 24 volt power. The APU can be dismounted using a davit (crane) carried on board and sandbagged for noise suppression. A single APU can provide power for two M577s. The compartment includes features such as map boards, folding tables, radio, computer terminals and other command and control equipment. This variant is also used as a medical vehicle serving as a battalion aid station ambulance exchange point and a jump aid station. M667: MGM-52 Lance missile carrier. M688: Lance missile transport/loader vehicle based on the M548. XM696: Recovery vehicle based on the M548. M727: Unarmored carrier/launcher for the MIM-23 Hawk surface-to-air missiles. XM730/M730: Unarmored carrier/launcher for the MIM-72 Chaparral surface-to-air missiles of the M54 system. The XM730 was formerly the XM548E1. The complete system is known as the M48. M730A1: M730 with M113A2 improvements. M730A2: M730/A1 with M113A3 Reliability Improvement of Standard Components (RISE) upgrades. XM734: Mechanized Infantry Combat Vehicle (MICV) prototype. Variant of the standard M113A1 APC with four firing ports and vision blocks on each side of the hull. XM741/M741: Carrier vehicle for the M163 Vulcan Air Defense System (VADS). M752: MGM-52 Lance missile launcher. M667 with Lance launch fixture. XM806/XM806E1: Armored recovery vehicle variant with winch in rear compartment. M901 Improved TOW Vehicle (ITV): M113A1 with dual M220A1 launchers for the TOW anti-tank missile. M901A1: M220A2 launcher permitting the use of the TOW 2 anti-tank missile. M901A2: Variant with unknown differences, possibly M901s brought up to M901A1 standard or M901/A1s on the M113A2 chassis. M901A3: Variant based on M113A3. M981 Fire Support Team Vehicle (FISTV): Artillery forward observer vehicle. Equipped with sights and other targeting instrumentation in a turret deliberately designed to resemble that of the M901. The M981 FISTV has been supplanted by the M7 Bradley and M1131 Stryker fire support vehicles. M1015 Tracked Electronic Warfare Carrier. M1059: Lynx Smoke Generator Carrier (SGC). Uses the M157 Smoke Generator Set (SGS) on the M113A2. M1059A3: M1059 variant using the M157A2 SGS on the M113A3. M1064 mortar carrier: equipped with an M121 120 mm mortar as replacement for M106. M1068 Standard Integrated Command Post System Carrier: A modification of the M577 Command Post Carrier. XM1108 Universal Carrier. A stretched M113A3 chassis with 6 roadwheels per side. Uses a cab from a M270 MLRS. Could be fitted with different weapons and equipment. Never fielded. M113-1/2 Command and Reconnaissance (Lynx): Smaller command and reconnaissance vehicle built by FMC using M113A1 components, with four drive wheels on each side and the engine in the rear. Lost out in US competition to the M114, but was employed by the Netherlands and Canada (where it was known as the Lynx). T249 Vigilante: prototype 37 mm self-propelled anti-aircraft gun that never entered service. M474 TEL background, PTS/PS carrier in foreground.